A better myvi in terms of engine, gearbox, interior? 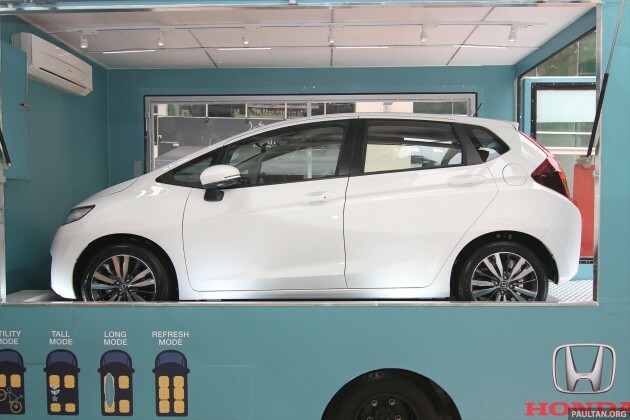 Get the new Honda Jazz! It is better waiting in GSC for Transformer movie rather than the GSC from Proton. Btw, what wrong for the GSC, as per committed (already delayed for few times), this car will launch in the second quarter of 2014, right? walaupun kereta ni Jepun kononnya, kami mesti berwaspada meniliti kalau kereta ni ada elemen Yahudi dalam engine atau chasisnya. Memang benar terbaek! Minyak enjin pun kene chek ade tak DNA haiwan haram. The “S” look gud oso.. If CVT gears, why it needs paddle shift???? Like 2014 new City, I think the 1.5V will have. why no paddle shift even on top variant? i want paddle shift. grrrrr…. If CVT gear, why it needs a paddle shift??? No cruise control I suppose… with those missing buttons on the steering wheel. All wise and all knowing UiTM graduate. But cannot write proper English. since when people do commenting need to use proper english? this school or wat? even u sent sms or watsapp use broken english..
Hope it price less then honda city… is a ckd anyway! I hope they can offer the paddles and the cruise control. Thanks Paultan for the updates, appreciate it. I think we will get cruise control,in 1.5V. Paddle shift?I don’t think so. The gear is not even the same gear lever on the Fit. This looks ordinary and boring. Bad timing for Proton GSC with this car around the corner. If this car is priced competitively, it will outsell Proton’s GSC for sure. Rear looks like a mini-CRV, dash like a City. Hmm, nice but I still prefer a ‘sharp edges’ design. Also, probably will look better with different rims design, i.e. less spokes? What’s the price? Around 50k? It’s Volvo inspired tail design..
Hope honda keep VSA for all variant. Only bee sting antenna, no cruise control, no econ mode, and less boot space than all new City. I will be surprise if this expensive than City. 2.53% only? i managed to get 2.4% for my jazz hybrid earlier this year. I thought 2.4% consider high already..
Honda BS Malaysia expected BS QC n bQ. Haha.. so the old and outdated engine with 4 speed gearbox must be your choice! Ops, I mean those “tested” and “proved” engine and gearbox! Don’t really like the aircon touch screen virtual buttons. It diverts your attention while driving on the road, to find the location of the button to press. BTW it is reported on carlies.my, that Honda Malaysia plans to price the lowest S-grade at RM65K+ without insurance. Don’t tell me those are fake stitchings on the dash… Honda also following Toyota route now? This should be a very practical small car and fun around city. But don’t expect Type-R handling. i remembered the gear knob was way cooler on the other post & preview. The doc wage gear lever is only found on the Fit(jazz) hybrid. Both jazz hybrid and city hybrid will be launch about August or September(this is said to be confirm by a roadshow SA) and will serve the range topping variant of each model, paultan previously reported it will get a 7- speed DCT and two motor system, and both will be CKD. I am suspicious of this news as Hondas DCT was only launch last year, and Japanese are not known to give the best tech to their CKD cars, much less Malaysian CKD car. looks like spacious luggage compartment and interesting seat various position for different model, makes a bicycle can put inside. actually i planning to buy a new jazz spec v+ .coz i see on thailand web site i satisfied for that , but..bad news on malaysia only have e s v spec and v is a highest spec ,if compare to v+spec v spec less 1.body kits n body part 2.cruise control 3.paddle shifters the most important is rm75k can get v+spec in thailand .then v spec i think the pricing around 86-89k in malaysia .we are pay more and get less why………. I think there’s cruise control on this V-spec. I Think at the steering (7 o’clock position beside the horn). There’s these 3 buttons I think for cruise control. Correct me if I’m wrong. BTW… is it serious the lower spec is only selling for RM65k!!!!! Seriously? If this is true and with the current 3 years free service package / 10,000km service intervals. I’m totally hooked. Got to get rid of my P2 immediately. nope…thats for handsfree control. autocruise suppose to be the same position as audio control but on the right side. anyone knows if the engine still paired with the old generation IMA hybrid system?? Totally not worth, small car with fabric seats looks like BLM, only for those youngsters who likes to be different than other people. welcome GSC..oppsss, silap pulak. GSC tahun depan kut. the rear lights just look cheapo… man..bring back the first gen of jazz! The new Jazz also remind me of our Myvi SE Limited Edition. There shared many similarities, just that I really hope to see Perodua to cop up with at least Japan’s automobile standard, really soon. I believe Perodua has such potential rather than Proton. Hmm… What do u think? Jazz has always been an ugly short and fat looking junk.